A few years ago, I spent a month travelling around Italy. One of the best meals I had was a long table dinner in a working vineyard in Tuscany. It was a long ornate table set with wine and vin santo (dessert wine) made on site. It was truly one of the most amazing meals I’ve ever had and set in one of the most beautiful places I’ve travelled. The added bonus was meeting and getting to know people from all over the world and hearing about their travels. Well the Italian Cultural Centre is bringing a bit of that Italian feel of the outdoor long table dinner to East Vancouver. They are hosting a long table dinner which will showcase local, organic and sustainable produce and cuisine. 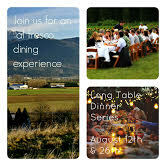 The long table dinner will take place Wednesday, August 26th from 7:00 to 10:00 pm. This event is a collaboration with Slow Food Vancouver and is being billed as an “Urban Farm to Table”. You are invited on a food journey through Vancouver’s urban farms and learn about their sustainability. Tickets are available online or by calling Veronica at the Italian Cultural Centre between 9:00 am to 5:00 pm at 604.430.3337. We look forward to seeing you. This is one event we won’t be missing.